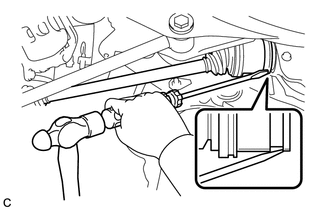 (a) Align the shaft splines and install the rear drive shaft assembly using a screwdriver and hammer. Set the snap ring with the opening facing downward. Be careful not to damage the oil seal, boot or dust cover. Install the drive shaft assembly while keeping it level. 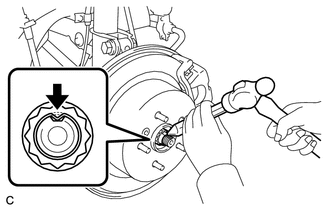 (a) Clean the threaded parts on the drive shaft and axle shaft nut using a non-residue solvent. Keep the threaded parts free of oil and foreign objects. (b) Install a new rear axle shaft nut. (c) Using a chisel and hammer, stake the rear axle shaft nut.